On August 4, 1915, Inspector Harry H. Caldwell of the Oakland (California) Police Department's Bureau of Identification wrote numerous letters to "Criminal Identification Operators" asking them to meet in Oakland for the purpose of forming an organization to further the aims of the identification profession. A group of about twenty-two men met and, as a result, the "International Association for Criminal Identification" was founded in October, 1915, with Inspector Caldwell as the presiding officer. By 1916, when the second annual conference was held (Leavenworth, KS), the membership had grown to 116 regular members and 13 honorary members. California received the first IAI State Division Charter in 1916. (The Association currently has 44 Divisions representing 48 states and 45 countries). In 1918, at the fourth annual conference, the word "Criminal" was dropped from the name of the Association, in recognition of the volume of noncriminal work done by identification bureaus. In 1921, at the seventh annual conference (Washington, DC), the IAI achieved considerable attention from the highest level of the United States government. 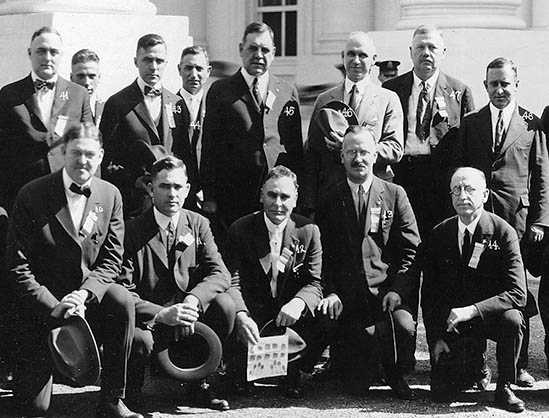 Members attending the conference were received at the White House, and it was during this meeting that inked fingerprints of President Harding were recorded. This level of influence was maintained for decades, as evidenced by documents revealing communication between the Association and Presidents Roosevelt and Truman, and others in government. In 1924 the Science and Practice Committee was formed to provide technical assistance to the membership. The IAI sanctioned an official "Reward Poster" for the arrest and conviction of anyone killing an IAI member while in the discharge of his official duties. In 1926 Clara Parsons (Superintendent of the State Bureau of Identification, Albany, New York) became the first woman to be elected to the Board of Directors. By 1929 the IAI had grown into a large professional association with the following committees in place: Membership, Resolutions, Credentials, Legislative, Science and Practice, Auditing, Ethics, and Press and Compliments. In addition, most states had Regional Vice Presidents (currently titled Regional Representatives). Canada, China, Cuba, Mexico, and the Philippines also had Regional Vice Presidents. During the 1930s the Association's membership dwindled as a result of the Great Depression. It was during this period of time, however, that the IAI established a close relationship with the FBI. In 1942 IAI elected its first woman President -- Marie M. Grott (Superintendent of the Indiana State Bureau of Identification, at Indianapolis). Since then, eight other women have held the office of President. In 1945 the annual conference was canceled because the United States government restricted travel as part of a wartime conservation effort. In 1958 the Association established the John A. Dondero Memorial Award in honor of his many contributions to the field of identification. It is the highest honor an IAI member can receive. It is awarded for the most significant contribution in the area of identification and allied sciences during the calendar year immediately preceding each annual conference. Its first recipient was J. Edgar Hoover. 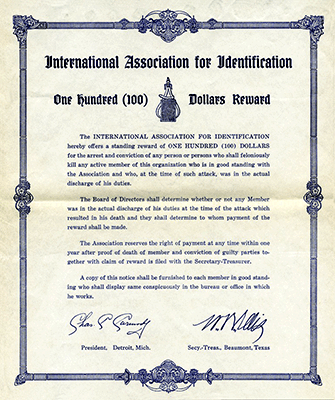 On May 10, 1967, the International Association for Identification was incorporated under the laws of the State of Delaware. In 1973, after a three year study, the Association adopted the far-reaching standard that "No valid basis exists to require a predetermined number of characteristics to exist between two fingerprint impressions in order to establish positive identity." In 1977 the IAI established its first certification program, the Latent Print Certification Program, a rigorous testing process validating one's expertise in the science of fingerprints. By 1990, the Crime Scene Certification Program was functioning with a comprehensive testing process for three levels of certification. The IAI now has seven Certification Programs including Forensic Art, Footwear and Tiretrack Analysis, Bloodstain Pattern Analysis, Forensic Photography/Imaging, Tenprint Fingerprint Certification, and Latent Print. The IAI first published a periodical in 1916 titled,The International Identification Outlook, which was discontinued after a year because of a lack of funds. The Association's second periodical,Sparks from the Anvil, was published from 1933 to 1937. From 1940 to 1950 the IAI's publication, IAI Monthly Newsletter, was simply mimeographed sheets. In 1951 a magazine format was developed and Identification News was published until 1987. A special Publication Committee was appointed in 1986 and, following the committee's recommendations, the Journal of Forensic Identification, a peer reviewed journal with original technical articles and case reports, was initiated in 1988 and continues to the present. Identification News was re-started in 2008 to focus on Association news. In 1988 the IAI established the Robert L. Johnson Foundation to provide research/educational grants and scholarships to help promote the advancement of forensic identification as a profession. It is now known as the Johnson-Whyte Memorial Foundation Fund, having been merged with the William Whyte Fund in 2008. Since 1996, the IAI has sponsored training seminars in various forensic science areas. These classes are held in different locations throughout the United States and are open to non-IAI members. In 2000 the Association created a Student Membership category for full time college students who are majoring in law enforcement and/or forensic science related fields. This program allows a student the opportunity to avail themselves of the educational information and training offered to IAI members. The IAI's Annual Educational Conferences now attract more than 900 participants and feature many workshops and presentations given by leading experts in forensic identification and related fields. The IAI prides itself on being an international association. Although most conferences have been held in the United States, several have been held outside the United States. Conferences were held in Canada in 1925, 1935, 1950, 1980, and 2003, Cuba in 1952, Bermuda in 1954, and England in 1986. The Centennial conference was held in California in 2015. Today's IAI has grown into the most prestigious professional association of its kind in the world, with more than 7,000 members from the United States and many other countries. The advancement of forensic disciplines through education continues to be one of the top priorities of the Association.